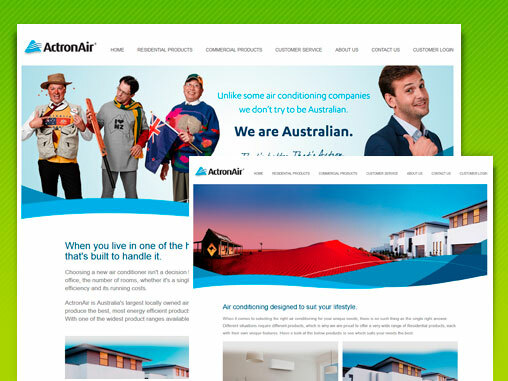 ActronAir are leaders in the Australian air conditioning industry with over 25 years experience. Our website hosting packages offer flexibility and all the features you’ll ever need for your business or personal website. Upgrade your plan at any time as your needs change. WebPress is designed to power your website and make it simple and cost-effective to manage. Control all aspects of your website yourself, without having to know complex HTML or FTP. MailBuddy gives you everything you need to run successful email marketing campaigns. Create and send great looking emails, track the results and manage your subscribers. Our website hosting packages offer flexibility and all the features you’ll need for your website. We offer the ability to upgrade your plan at any time, as your needs change. A dedicated server gives you a flexible and scalable hosting solution that allows you to customise and individualise server settings for your unique requirements. Now you can have your own personalised email address when you register your unique domain name and sign up for one of our email hosting plans. Protect your emails with the most comprehensive solution to email threats on the market today. Our anti spam engine guarantees protection from spam, viruses & more. Website design & creation is one of our main services. We strive to ensure our clients are happy with every aspect of the creation process and in particular the final result. Replace your desktop applications with web based systems to gain scalability, portability and accessibility. We create custom applications that meet your needs. Your e-commerce website is a virtual representation of your business and should be effectively used to display your products in order to increase sales. Power your website with WebPress and make it simple and cost-effective to manage. Control all aspects of your website without having to know complex HTML or FTP. SEO is the strategic and technical process of enhancing your website to achieve optimum search engine rankings on targeted keyword searches. Run successful email marketing campaigns with MailBuddy. Create and send great looking emails, track the results and manage your subscribers. Copyright © SiteFactory 2012 SiteFactory is a Sydney based web development company specialising in website development, web application development, CMS, ecommerce, graphic design, hosting, dedicated hosting, search engine optimisation, google analytics, email hosting & email marketing.